Given by W.H. Maund, Esq. Tea or coffee cup in soft-paste porcelain painted in enamels and gilded. 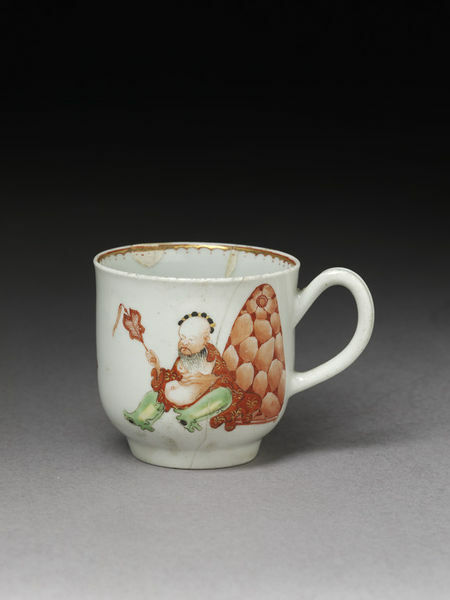 With grooved loop handle and foot ring triangular in section; the outside decorated with an Chinese man, perhaps representing Putai, who holds a fly whisk. 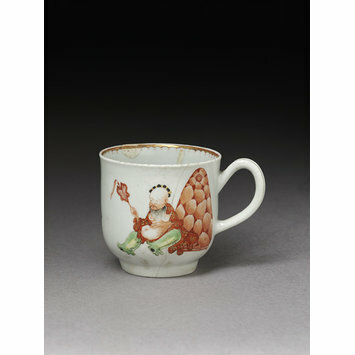 Also on the cup are two female figures. All painted in a palette of iron-red, green, black, lilac, yellow, blue and gold. The interior of the rim with a delicate pattern resembling arches and dots, in iron red and gilding.